Note: This post, and the next one (part 2), are obsolete. They have been replaced by this one, offering a simpler method to get started. They are left here for reference. Part 1 (this article) is in yellow. Part 2 (next article) will cover the Mosquitto server (just below) and the DIY HomeKit Device. The rest will be detailed in future articles, over the next few weeks. 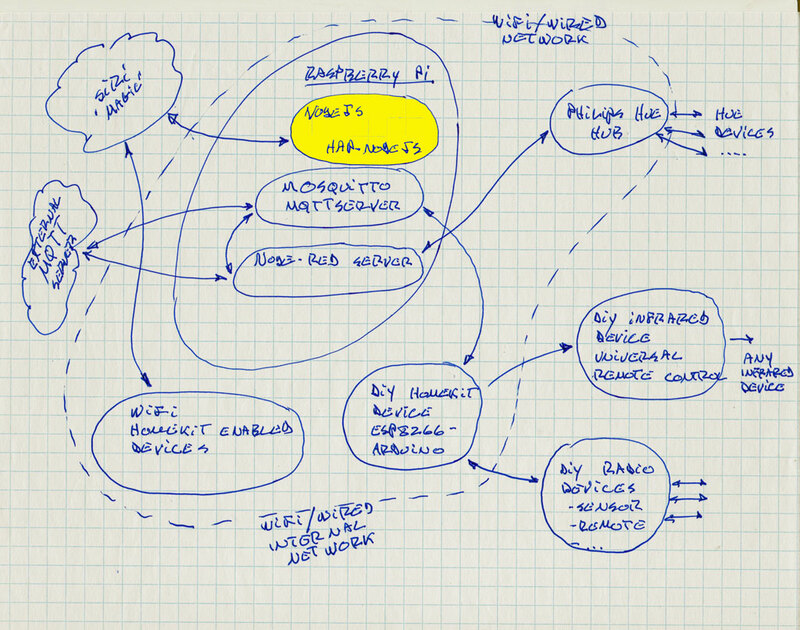 This is my initial project involving the Internet of Thingd (IoT). Basically, as a first IoT project, I wanted to control a light using Apple HomeKit (thru Siri). The idea is simple: Tell Siri to turn a light On and Off. The execution is not that simple. The MQTT server has to communicate with your HomeKit accessory. An Arduino in this case, using the ESP8266 Wifi chip. Any phone that can talk to Siri will do, but homekit is only available on iOS 8 and newer. Most iPhone should be OK (I’m currently using it on iPhone 4s, 5 and 6s). If your running iOS 10 or above, you also have the native HomeKit application available. The HomeKit server emulates a HomeKit bridge (like this). There are many ready-made HomeKit bridges offered as an interim solutions until devices start incorporating the software into the hardware (Philips Hue, Elgato Eve, Lutron Caseta). But most of them are not Open Source and most will only work with their hardware. So we use HAP-NodeJS to emulate a HomeKit bridge on a Pi. This will allow us to simulate a “general” HomeKit interface. The goal is to be able to talk to our own hardware, but also to program our way into other HomeKit Bridges, like the Philips Hue. The HomeKit server, or HomeKit emulator, receives and sends information and command from/to the internet, from/to the Siri servers. That’s the magic of Siri: you give it commands and it will find the proper device through the network into your home! Communications work both ways: devices can report their status to the Siri servers, and those will let you know what is happening. More info on Apple’s site. I installed the HomeKit server on a Raspberry Pi. It could be installed on any Linux server, although I had all sorts of trouble installing it on Ubuntu 14.04 or 16.04. Installing it on a Pi using the instruction below was easy. How that you have Siri communicating with a server in your house, you need to talk to a server that will translate the Siri info and commands into messages exchanged with your electronic gadgets. For this, we use MQTT, a (fairly) simple protocol that will exchange simple messages with the actual devices. The MQTT server will act as a bridge between your electronic thing (in this case an Arduino) and the HomeKit bridge. Basically, the device that you want to control has to “subscribe” to a topic (a class of messages, if you want). Subscription can work both ways. The device will then “listen” for messages on the appropriate topic. It can take action on the messages received. Internet Down” problem, unfortunately quite common here, in the back country. Installation is based on this article. The MQTT server is listening to both the HomeKit server (that communicates with Siri) and your actual electronic device. So the electronic device had to be able to understand MQTT. In this experiment, I use an Adafruit Huzzah Esp8266 micro controller. It’s a small, cheap device (10$) that has Wifi on board, and an Arduino compatible micro-controller. I use a Raspberry Pi 2, with Respbian Jessie downloaded from the raspberry.org site. It comes with an old version of Node.js but HAP_Node.js requires a newer version. What processor am I using? Wheezy or Jessie version of Rasbian? I then installed Node 4.6.0. But you could install the latest version if you want. My RaspPi is running on an ArmV7 processor. or via package manager as root from official repo which is what I tested last. For a more current version of node, replace the version numbers above. I had success with that. If it works, jump the manual install below and go to the test part. If this is not followed by a fatal error, because of a missing module, you’ve just completed the first part of the setup. On your iPhone (or iPad), start the HomeKit application. From the main screen, tap the + in the upper right corner and chose “add accessory”. You should see the accessories enumerated above.